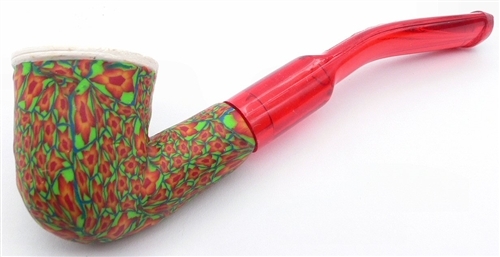 Green, Orange and Red Fimo Meerschaum Pipes - Outlines of blue accent the shapes of this colorful Fimo pipe. Each pipe is hand carved and one of a kind. Our Fimo pipes are hand carved from 100% Solid Block Meerschaum and are Made in Turkey. After carving the meerschaum pipe Fimo clay is then baked around the outside bowl and shank for a bright, colorful look. Every pipe is hand made making it a unique special piece of art and conversational piece. The mini pipe is a perfect size for a quick smoke and the bowl is guaranteed to never burn out as what happens with some briar pipes. Stem color may vary from the picture. 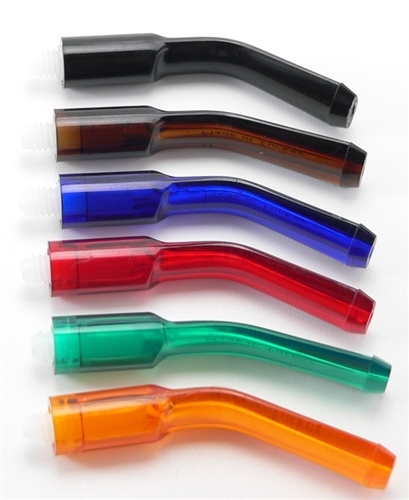 If you want a particular color please include your stem color choice in the notes section of your order. Color choice is black, brown, blue, red, green or amber. 100% satisfaction guaranteed. Because these are one of a kind pipes your design will vary from the picture. Sizes also differ slightly and all dimensions are approximate.